Parkadwadi (hamlet) is a new settlement of the old village, 2kms from the original village Loni in Jamkhed block. The village faces severe drinking water scarcity. We have implemented a water system allowing the village access to a safe water supply. • Digging and refilling of the trench for the raising main and distribution sub - prime. • Construction of new water storage tank (30,000 lts capacity). • installation of electric pump with accessories including electric boards deposit. • Exposure visit and trainings given to pani samittee SMS, SHG s and GP members. The village community had identified the perennial source in the water submergence area of percolation tank. There was one existing drinking water well which has perennial sufficient water. At present this well water is being used for drinking water purpose by the main village. From the same well water is being lifted through electric pump and transported through underground pipeline of 3000 meters and stored to the newly constructed water storage tank of 30,000 ltrs. capacity. The water is distributed through the individual tap connections and stand posts. The water committee and the SMS are responsible for the implementation, supervision, quality control and monitoring of the activity. I visited Parkadwadi hamlet in November 2010 as part of a tour of several villages in Maharashtra state that benefited from drinking water, sanitation and watershed development projects overseen by the Watershed Development Trust (WOTR). Background about this project is available here: http://peerwater.org/projects/43-1-of-8-Drinking-Water-Project-Parkhatwadi- My report will augment and update this posting. 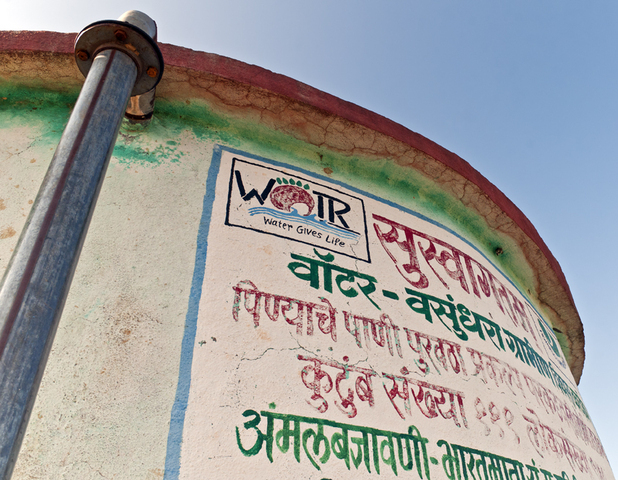 Once the hamlet households agreed to implement the drinking water project, WOTR worked with a committee of 16 village women to coordinate the implementation. Each household was required to contribute money to cover 20 percent of the total construction cost. Villagers also supplied labor. 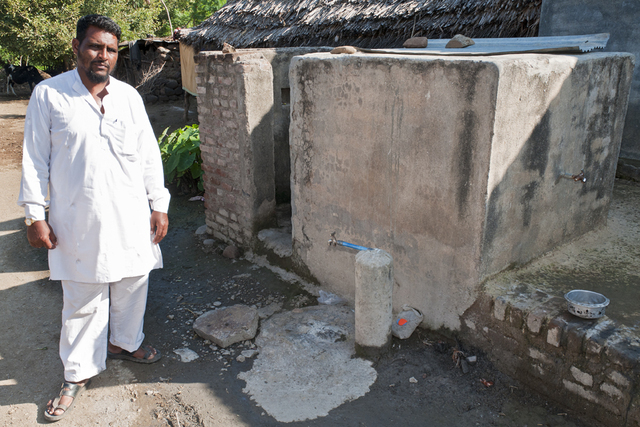 Households also pay 30 RS monthly to cover maintenance costs. The committee hired a retired technical engineer to help design the project. They researched how best to purchase the pipe and ended up ordering directly from a factory to save money. A three-kilometer long pipeline was constructed from the restored well to the hamlet and individual water lines and taps were installed to each home and to the school. According to the hamlet leadership, the drinking water system has worked well with no problems since it was completed in 2008. 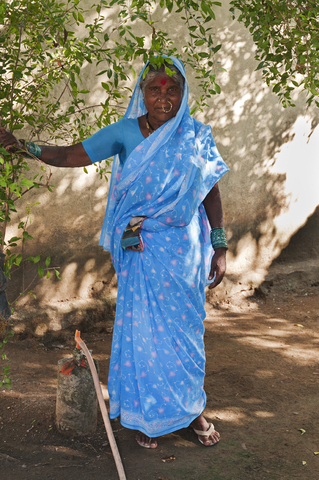 The burden of collecting water falls onto the women in India. The women of Parkadwadi spent three hours each day collecting water from wells up to two kilometers away. Now the women can work in the fields to help their households grow food and earn incomes. 1. Parchundi village is situated at a distance of 10 km. off side from the main road of Beed. 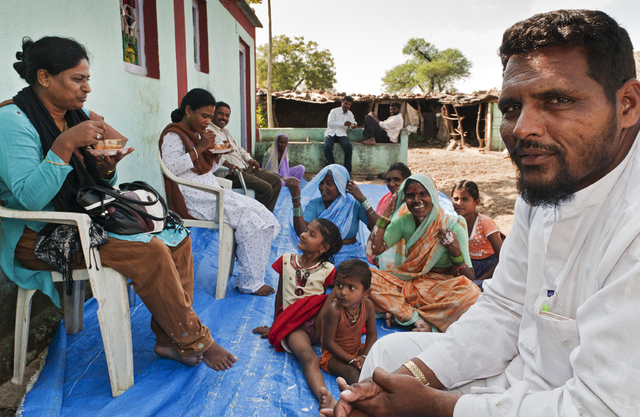 The village lies in Beed district, which is one of the most drought-affected districts in Maharashtra state. The village is a home to 111 households with 813 inhabitants. The main occupation is farming. Due to food shortage and lack of livelihood options majority of the people migrate to different sugar factories as sugarcane cutter for 6 months and the rest moths are engaged in agriculture. The village faces acute drinking water problem especially in summer months and water is brought through tankers. 3. Amount funded: 3,552 USD, Final cost of the project: 3,552 USD, Annual maintenance cost: 1,145 USD. 4. Activity : 1. In the village there is an existing well with a electric pump which was connected to the drinking water storage tank through the pipeline, but was defunct for last 5 years as there was no water in the well. 2. A new bore well was drilled of 6 inches diameter to 180 ft length and a submersible pump of 6HP (horse power) was installed on the bore well. 3. A new pipeline of 265 meters was connected from the bore well to the existing well. The old pipeline (1000 meter) as well the old electric pump was repaired and water from the well is being lifted to the old water storage tank. A total of 14 stand posts were newly constructed through which water is distributed in the village. 5. The problem of drinking water was addressed with the initiative of the Samyukta Mahila Samitee (SMS). The water committee and the SMS are responsible for the implementation, supervision, quality control and monitoring of the activity. 1. This is a new settlement of the main village Loni in Jamkhed block. Prior to 1992-93 this hamlet did not exist. The villagers stayed in Loni. But in the year 1992, there was a very severe earthquake which occurred in Latur district and more than 50,000 people died. At the same time earthquake was experienced in Loni village. Therefore, some families shifted from Loni village and preferred to stay in present place (Parakhadvasti). Since this settlement has an establishment few years back, about 111 families (950 inhabitants) live in this area. There are no infrastructural facilities such as internal roads, drinking water facilities, proper drainage system etc. The women have had faced serious problems while fetching water from the open well and specially in the late evenings it was risky to collect water manually from the open wells. Last 5 years, two women fell in the well while collecting water in the late evening and similarly during the last 3 years, three women also met with the same incident but fortunately their lives were saved by others villagers. Therefore the women members of 6 SHG groups have taken the initiative to solve their drinking water problem. 2. Start date : 1 April 2007, completion date : 31 April 2008. 3. Amount funded: 15,675 USD, Final cost of the project: 15,675 USD, Annual maintenance cost: 682 USD. 4. 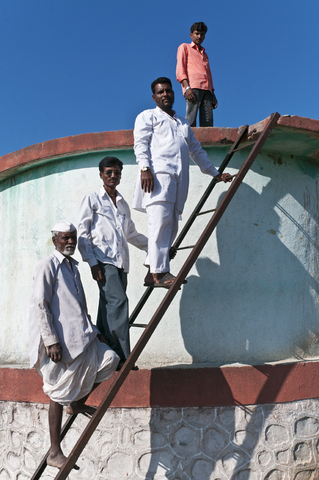 Activity : There was an existing well in the main village-Anandwadi. From this well the water is being lifted by an electric pump of 7.5HP and the water is transported through the underground pipeline of 3,000 meters to the Parakhadvasti. This water is stored in the newly constructed drinking water storage tank of 30,000 liters capacity and is distributed by individual tap connections. 5. The water committee and the SMS are responsible for the implementation, supervision, quality control and monitoring of the activity. 1. 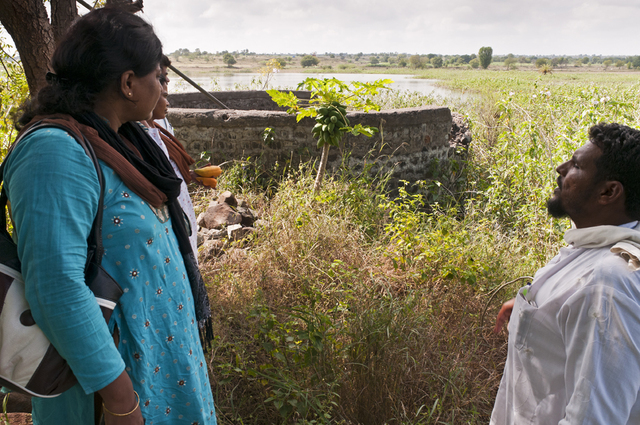 The Vaitagwadi is the hamlet of the main village Neknur and a drought affected. It is situated in the Beed district at a distance of 30km. from Beed headquarters. The main occupation of the people is agriculture which is mainly rainfed and insufficient for livelihood activities. Therefore majority of the families migrate to the sugar factories for 6 months as sugarcane cutters. The drinking water was provided to the hamlet through pipeline from the bore well. But the borewell was defunct for the last 3-4 years and people had to fetch water from nearby private wells from far distance. 3. Amount funded: 2,729 USD, Final cost of the project: 2,729 USD, Annual maintenance cost: 573 USD. 4. Activity : A new bore well of 6” diameter and 240ft in length has been drilled near the existing well. The water has been lifted through 5HP electric pump and the same is being supplied by the existing underground pipeline of 1000 meters. The water is being stored in the 3 existing water storage tanks of 3000/liters capacity which has been constructed by the government. Distribution system pipeline of 200 meters has been laid down. Repairs of old pipeline of 300 meters and construction of 7 stand posts have been done. Initially in the PWX round, a consolidated proposal for 9 project villages had been submitted. Out of the 9, 8 villages were selected. The drinking water project activity has been completed in 7 villages and in one village the activity has been cancelled. 4 Karande, Gaikwad, Nagare Patil and Barve hamles 5. Thakar hamlet 6. Nandora 7. Morewadi. The 8th village Koudgaon which was selected was cancelled. 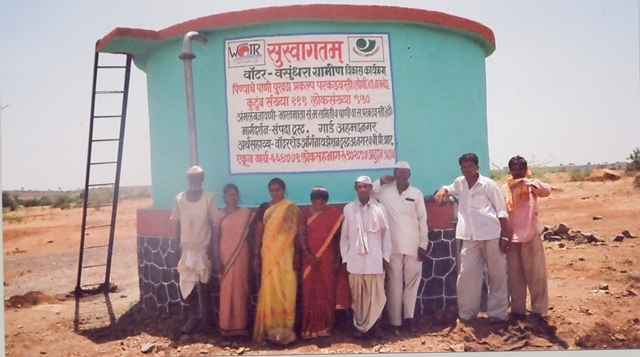 Background: The watershed development programme has been implemented in Darewadi during 1996 – 2000. Due to the implementation of watershed development programme, the water level in the wells and the ground water has increased considerably which has solved the drinking water in the main village. But in the remote hamlets, the villagers still face acute drinking water problem in the summer months. The Karande, Gaikwad, Nagare Patil and Barve hamlet from Darewadi village were selected for the drinking water project. The four hamlets comprises of 360 inhabitants (194 men, 166 women). 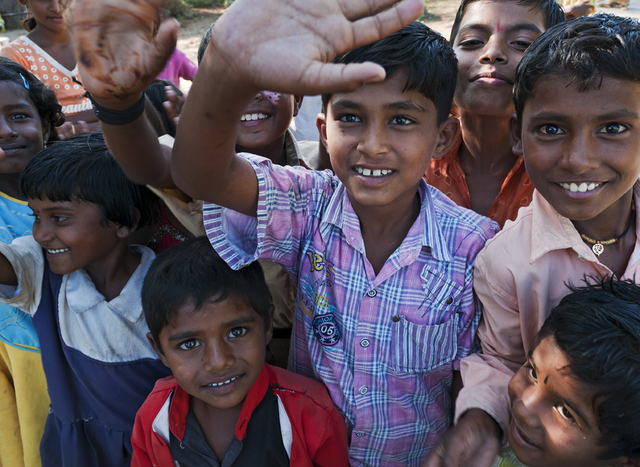 Out of the 360 inhabitants, school going children are 56. 2. Start date : November 2007, completion date :31st May 2008. 3. Amount funded: 6121 USD, Final cost of the project: 6121 USD, Annual maintenance cost: 621 USD. 4. Activity : 1. From the main drinking water supply scheme of Darewadi, a pipeline was connected to 4 hamlets. The total distribution pipeline is of 13,370 ft. A drinking water tank of 5, 000 liters was constructed in Nagare hamlet. One stand post was constructed in Karande, Barve and Gaikwad hamlets respectively (total 3). Due to initiation of this activity, the households now get safe drinking water. The existing Village Development Committee of the village has implemented this activity. The gram Panchyat (local government) of Darewadi has taken the responsibility of the maintenance and the water tax collection of the project. 1. This tribal hamlet is a part of the Darewadi main village and situated at a distance of 3 km in remote area from Darewadi village. The total households are 20 (105 inhabitants). The main occupation is agriculture (rainfed) and people are farm labourers. Since this hamlet is situated at far distance from the main village and in the interior it is neglected by the main village as well as from the government departments. There is a storage tank of 10,000 litres capacity constructed by the government department. During the scarcity period, in summer months, water is brought through tankers and is stored in this tank for domestic purposes. But the tanker water is provided erratically once in two three days and the timing is also not fixed. Therefore the people have to wait whole day for the same. 2. Start date : December 2007, completion date :31st May 2008. 3. Amount funded: 915 USD, Final cost of the project:915 USD, Annual maintenance cost : 240 USD. 4. Activity: Deepening of existing well, pipeline and motor installation. The community well which had sufficient water was deepened inorder to increase the water storage capacity of the well. This water was lifted from the well by installation of BHPE pump on the well. 2/12” DHP underground pipeline of 500ft distance has been laid down to transport the water from the well and thus water is stored to the exiting storage tank (10,000 liters). Taps are connected to the storage tank and water is collected from it. 3. Amount funded – USD 11,081. Final cost in USD 11,081, Annual maintenance cost : 716 USD. 4. Activity : A new well has been excavated and constructed in cement concrete below down the water harvesting structure (check dam) on the main drainage line. The underground pipeline of 578 mtrs in length has been completed. A submersible pump of 7.5 HP has been installed to lift the water and it is stored in the newly constructed water storage tank (RCC) of 30,000 ltrs capacity. The water is being distributed through 2 stand posts. This project has been implemented by the Women’s Pani Samittee. This hamlet comes under the Group Gram Panchayat. The Pani Samittee would be treated as the sub committee of the gram Panchayat and this would be responsible for the management of the project and to ensure the water distribution to all families. Other benefit: A cattle trough has been constructed for the livestock. 1. 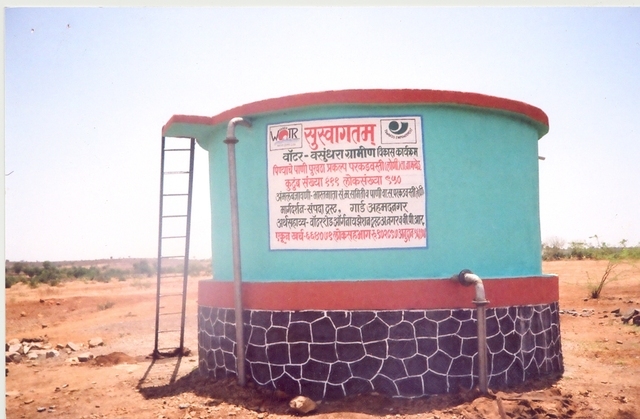 Morewadi is a hamlet of the main village Kerul which is the interior at 15 km from the block headquarters and come under the drought prone area in the rain shadow block of Ashti, district Beed. The hamlet is a home to 715 households This region has depleted natural resources and despair in rural livelihood.. The people face acute drinking water problem. The main occupation of the people is agriculture but the rainfed agriculture is insufficient to support the livelihood, hence 70% of the people migrate every year to the different sugar factories as sugarcane labourers. 3. Amount funded – USD 8,913. Final cost in USD 8,913. 4. Activity : (i) Deepening, widening and construction of the existing community drinking water well (ii) construction of drinking water storage tank of 20,000 litres capacity. Since the village is situated at a higher elevation there is no permanent water source in the village. Therefore, the old community well which is located at the 600 mtrs distance from the village has been identified as water source. The repairs of the same have been done. The 5HP electric pump has been installed to lift the water and to be stored in newly constructed storage tank of 20,000 ltrs capacity and another storage tank of 2000 liters capacity. A pipeline of 860 meter has been connected to drinking water tanks and a pipeline of 460 meters has been laid down for the distribution of water. The water is being distributed through individual tap connections. The half yearly water charges is being collected from all the eligibile families (excluding single parent holders and widows). This water charge includes the operational cost such as electric bill, water distributors honorarium, minor repairs and maintenance, purification of water expenses (TCL powder). Besides a provision of reserved fund has ben made inorder to ensure the replacement of pump sets or any other minor repairs of valves, pipes etc. Out of 9 villages, 8 villages were identified and the drinking water scheme has been completed in 7 villages. 1 village has been cancelled. - Trainings have been conducted by the WOTR team for the Pani samittee ,SMS and grampanchyat members regarding the safe drinking water and sanitation as well as the management sustenance for these 7 projects. - With the implmentation of the drinking water, and sanitation activities should be done to achieve the overall objectives of the project. The primary school is up to 3rd standard and there are 70 students ( 40 boys and 30 girls). 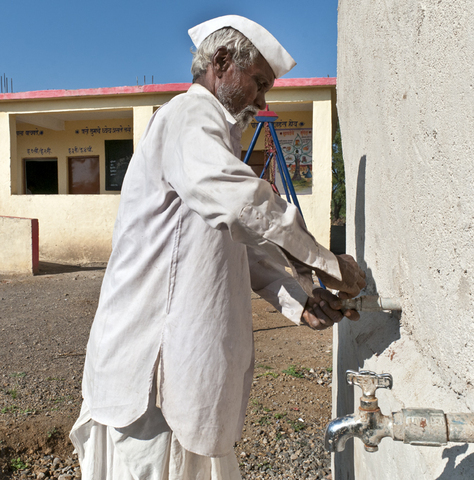 A separate tap connection is given to the school for drinking water. Now the chidlren get safe drinking water in the school premises itself.